::: Off the Radar :::: Blu-ray or HD-DVD? VHS or Beta, I know everyone has heard the tracks Night on Fire and You Got Me one too many times, maybe two too many times if you count the remixes. Well, the boys are back at it again, minus a member (Former VHS guitarist Zeke Buck is set to release the debut album from his own new band, People Noise, a duo with Matt Johnson (formerly in Boom Bip's band). And I just read that their keyboardist, Chea Buckley left the band also? WTF? Bring On The Comets was released yesterday on iTunes as a sneak peak. The album drops on August 28th. This albums sees the band move towards generic indie rock (wow, is indie rock really getting generic?) and further from their disco punk roots of their 2002 instrumental debut Le Funk (which is the funk in my opinion better than their breakout 2004 release). 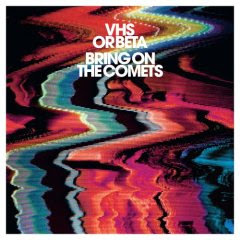 Regarding VHS or Beta’s transition from Night on Fire to Bring on the Comets, Pfunder states that the new album was written “for the world” instead of “for one group of people.” ie. We would like to make a lot more money by targeting a larger audience than our last album and possibly getting some songs on a Super Bowl commerical or two. The track Bring On The Comets sounds like it could be played by a few bands out their but Craig Pfunder's sets it apart. Burn It All Down brings the guys to dance floor complete with a catchy chorus asking to burn it all down (flags, houses, churches... Issues? Wanna talk about it? ).